LUAU BLACK 200 X by Tan Asz U Tanning Lotion Bronzer - 13.5 oz. 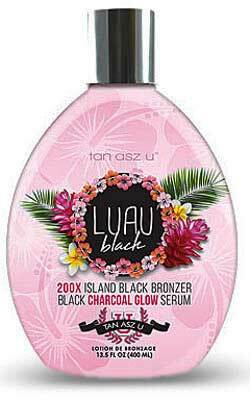 Home/Tanning Bed Lotion /Tan Asz U /LUAU BLACK 200 X by Tan Asz U Tanning Lotion Bronzer - 13.5 oz. Hawaiian nights are calling. Island Black bronzers emit paradise- level color, while a blend of black charcoal, Hawaiian butters, extracts, & fruit condition skin for a tropical goddess glow wrapped in a moment of sheer bliss. A one way ticket to Hawaii is just a bottle away. Save 50% BIKINI BLACK Advanced 200x by Tan Asz U Hot Bronzer - 13.5 oz.